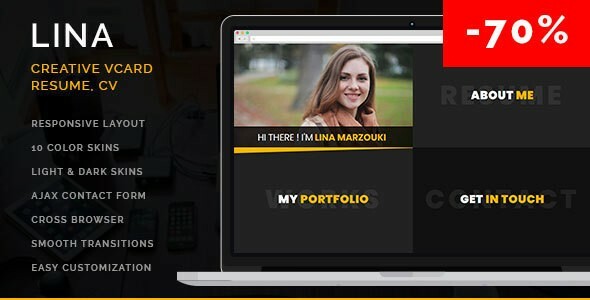 Lina Creative Portofolio Website Templates is an awesome vCard, CV, Resume & Portfolio website template. It is suitable for anyone who wants to have a personalized resume website with unique style, layout and colors. all code are well commented and super easy to customize. This flexible template uses fresh and clean design and allows to change it’s look to your liking in one click. This item is August Free File of the Month! And available free until September 01, 2018 23:59 AEST +10:00!